Replacement "O" ring seals and tool for the replacement of leaking "O" rings seals on the ANI R150 Mini guns. Kit is good for all size ANI Mini spray guns. 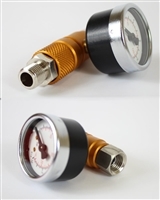 ANI pressure gauge is made of an aluminum body with PTFE gaskets, steel and glass components that are resistant to solvent cleaners and gun wash. 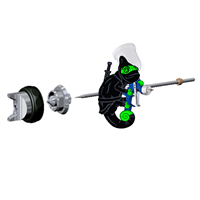 The lightweight aluminum body gauge weighs only 135 grams and is barely noticeable on the end of your spray gun. These are offered as a package add-on for all of our spray guns. Replacement needle and nozzle for the Air Gunsa Spray Gun. Will convert any Air Gunsa Spray Gun to 1.3 specifications. Replacement needle and nozzle for the Air Gunsa Spray Gun. Will convert any Air Gunsa Spray Gun to 1.5 specifications. Replacement needle and nozzle for the Air Gunsa Spray Gun. Will convert any Air Gunsa Spray Gun to 1.8 specifications. Replacement needle, nozzle, and air cap for the ANI R150 Mini Spray Gun. Will convert any ANI Mini Spray Gun to 0.8 specifications. Replacement needle, nozzle, and air cap for the ANI R150 Mini Spray Gun. Will convert any ANI Mini Spray Gun to 1.0 specifications. Replacement needle, nozzle, and air cap for the ANI R150 Mini Spray Gun. Will convert any ANI Mini Spray Gun to 1.2 specifications. The ANI R150 Mini Spray Gun is an extremely efficient and low-cost alternative to full-size spray guns. This mini gun packs the full-size performance into a compact and lightweight frame. 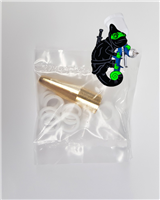 Available in 0.8 for ceramic coatings used on firearms. Copyright © K2 Concepts. All Rights Reserved.